Welcome to Day 2 of my Food for the Fourth series, today is all about Salads! Yesterday, I shared my Main Dishes, Chicken Phillies, All-American Burgers and Chicken Kebabs. Yum! 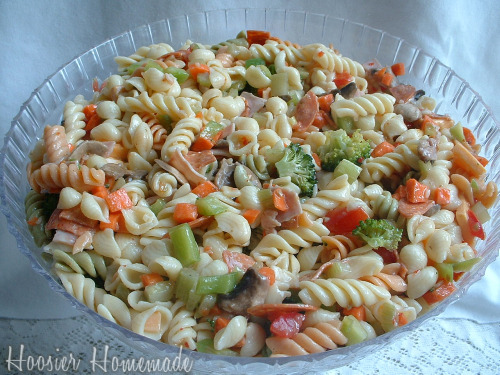 This Deli Style Pasta Salad is a huge hit at our house. It’s not only great as a Side dish, but also when it gets super hot during the Summer, I often serve it as a Main Dish. It’s very versatile, you can add any vegetables or meat that you like. 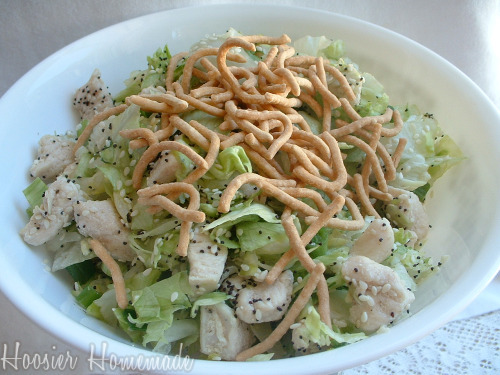 I know…Chinese Chicken Salad on the Fourth of July? But my family loves this salad, and everytime I make it to share at a cookout or gathering, it disappears! I honestly don’t have a great recipe for a Potato Salad. I usually just kind of throw it together with potatoes, eggs and mayo. But this New Potato Summer Salad from Kraft looks great! I’m anxious to give it a try, my family loves those little new potatoes. Do you have a favorite Salad recipe? Share it with us! All those salads looks so good. Thanks for linking up to Potluck Sunday. The Deli-Style Pasta Salad would be a huge hit with my family! Bookmarking for future reference! This is a great series for a pre-Fourth planning. 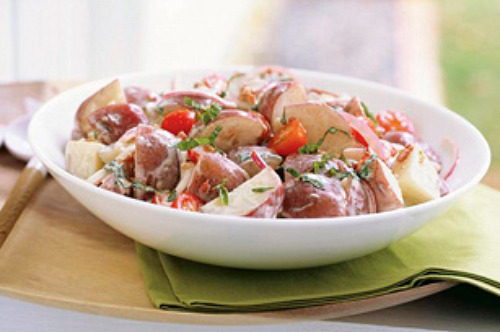 The new potato salad looks perfect for a picnic! @gfe–gluten free easily, Thanks for sharing Shirley! Those sound yummy! I am a sucker for salads…I could eat yummy salads like this all day long. I make a Greek pasta salad with orzo that I adore. You have to have a salad on the 4th! Here’s a radish salad – very festive! Thanks for the inspiration to get going on planning some thing fun and some new tastes for the 4th! It’s hard to beat a good pasta salad during the summer especially for the 4th of July. Happy 4th of July!